3 years old is almost the perfect age to buy a balance bike of your child. They should have the necessary co-ordination, balance and physical skills needed to ride a balance bike and there is lots of choice out there for this age group. ✔️ Top Tip - the seat height is the most important consideration when buying a balance bike. The seat height should measure 2.5cm (1 inch) less than a child's inseam (the length of the inner leg) so they can put their feet flat on the floor to push the bike along. Find out how to measure a child's inseam here. This Strider bike has adjustable handlebars and seat which will grow with your child.It’s lowest seat height is 11 inches which will be perfect for even the youngest child (from 18 months). It also means that younger siblings will be able to have a go as well. Strider recommend that most kids will start using the seat post around 3 1/2 years. This bike will really grow with your child and you shouldn’t need to buy another balance bike apart from this one. The tyres are made of eva foam so you don’t have to worry about pumping them up or punctures. Eva foam will also give a smooth ride along the pavement and tracks. They lack the traction of air filled tyres but they should be absolutely fine for most 3 year olds. They’re low maintenance which is always a bonus. The bike is super lightweight at just 2.9kg. A lighter bike will be easier for children age 3 to control. ✔️ Top Tip - a heavy bike may be harder for smaller, lighter children to control. If possible look for a balance bike which weighs no more than about 1/3 of your child's weight. JD Bug is a a name synonymous with scooters but they also make excellent balance bike too. It features an ultralight alloy frame which weighs only 3.6kg. This is super lightweight so easier for 3 year olds to control and manoeuvre. It has 12" chunky air tyres and rear disc brake. The build is robust and sturdy and it can be ridden indoors and outdoors. The seat height is 35cm to 40cm and the handlebar is 50 to 55cm. Both are adjustable. ✔️ Growing Room. Most bikes have adjustable seats. To make sure there is growing room in the bike, look for a maximum seat height which is at least 5cm (2 inches) greater than the child's inside leg measurement (inseam). This bike is very popular and I think the main reason is due to it's low price.Over on amazon it does have some very good reviews too. However, although it will be a great balance bike for some children it may be an awful choice for others so it’s very important to consider your child’s height when buying this balance bike. Although the bike looks small the lowest seat height is 33cm inches (13 inches) so your child should have an inseam of around 13 or 14 inches (33cm to 35.6cm) to be able to ride this bike. 13 inches (33cm) should be fine for most kids of this age group. At the other end, the highest seat height is 15 inches (38cm) so it’s not the best choice of balance bike for a very tall child as there isn't be much growing room. It weighs just over 3kg (7lbs) so is lightweight which will make it easier for lighter, smaller children to control and use. If you are buying a balance bike for a 3 year old, ideally you would want the bike to last until they are 5 and they are ready to graduate onto a pedal bike. The concern with this bike is that even though it’s cheap to begin with, you may find that you will have to buy a second balance bike for many children as they will grow out of it quite quickly. However, if you have a smaller 3 year old it is probably worth considering for a balance bike on a budget. ​✔️ Brakes. You will notice that most balance bike aimed at smaller children do not have brakes. This is because young children will not use a brake. They will stop with their feet instead. it's not until age 3.5 or 4 years that a child has the necessary hand / eye co-ordination to use a brake. So for younger 3 year olds don't worry about a brake. If they are heading towards age 4 a hand brake is a good investment. Make sure it has the right seat height. As stated at the beginning of the article the most important thing when buying a balance bike is to make sure that your child’s feet will be flat on the floor when they are riding their bike. This is essential as they will need to use their feet to push the bike along. If they can’t do this they will be unable to ride the balance bike. Therefore the seat height is very important when choosing a balance bike.To make sure the seat height on the bike is the right size, measure your child’s inseam. This is the length between the top of their crotch and the floor. ​Ideally a balance bike height from the seat to the ground should be around about one inch less than their inseam so they have the room to be able to get on and off the balance bike as well. ​✔️ Tyres. 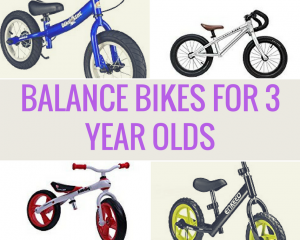 - most balance bikes aimed at young children have EVA foam tyres. Air filled tyres have lots of advantages (better traction),but EVA foam tyres are lighter and add less weight to the bike. It's important that bikes for young children are lightweight so easy to control. Also EVA foam tyres don't get flat. Which you go with may be a personal preference. The Enkeeo Balance bike is aimed at 2 to 6 year olds and is a mid range price balance bike. It's lowest seat height setting is 35cm and it's highest is 45cm. This seat height range makes it a good choice for most 3 year olds as the lowest seat height should be sufficient for them to start off with their feet on the floor but there is significant growing room so they can use it for a few years. The balance bike also feature adjustable handlebars the balance bike features adjustable handlebars 56cm to 63cm (22" - 24.8") so this bike really will grow with your child. ​It weighs 5.2kg so it's quite lightweight but not as lightweight as other choices such as the JD bug bike. A smaller, lighter child may do better with a lighter bike, but it should be fine for most 3 year olds. It features puncture-resistant EVA tyres help provide a smooth ride, great for riding on pavements or on paths around parks. The Early Rider Kids bike is as good as it looks. Sturdy, stylish and excellent quality, this is a fantastic investment for the 3 to 6 year age group. It's seat height measures from 38 cm to 47.5cm so it would suit a 3 year old who has an inseam of 35.5cm to 45cm. The seat height range spans 10cm so this is a bike which should grow with your child. ​The features 14 inch wheels with pneumatic tyres so will give a smooth ride and give good traction on more uneven surfaces. A great bike size for 3 year olds as there is growing room for them. It's super lightweight, weighing just 3.75kg. The drop handle bars give this bike a grown up feel so they can be like older siblings (or Mum and Dad). The build quality is fantastic. It's handmade and uses lightweight aluminium for the frame. It features a carbon seat post with 3k finish and rivetted, faux leather seat. It's seat height ranges from 31cm to 40cm so would suit 3 year olds who have a inseam range from 28.5cm to 37.5cm. Bear in mind that it's good to have a few cm growing room, so a 3 year old with an inseam of 37.5cm would need the seat on the maximum seat height. At 3.3kg it is very lightweight, so is easy for kids to control and for parents or adults to carry when kids have had enough. ​It features foam tyres which won't puncture. Summary: if you're looking for a balance bike on a budget this is a good choice. The Bikestar has pneumatic (air filled tyres). Air filled tyres offer better traction over surfaces, bumps in the pavements, on grass and dirt tracks etc. They are also good for going up and down curves. However, they need to be maintained unlike bike with EVA foam tyres. Air filled tyres are better as kids get older big and heavier and they offer more cushioning. As well as air filled tyres the bikestar has a saddle height range between 35-42 cm and an adjustable handlebar height from 55-62 cm. It weighs approximately 4.8 kg which isn't the lightest of bikes, however the weight of the bike matters less as kids get older and better. This is the only balance bike on this page that features a handbrake. Kids from aged about 3.5 years have the co-ordination needed to start using a handbrake. It's quite a good option to have on a balance bike as kids get older so that they can master an handbrake before they graduate onto a pedal bike where they will need to learn to use one. Most balance bikes have a tyre size of 12 inch which should be fine for most 3 year olds. This is the optimum size for most young children who ride a balance bike. They will ideally then be ready to transfer onto a 12 or 14 inch pedal bike. Some balance bikes for 3 to 5 year olds have 14 inch wheels so this size of wheel is something to consider as well. Tyres are generally either made of EVA foam or are airfilled. Both have advantages and disadavtages. EVA foam are puncture proof and are great for going along surfaces such as pavements and paths in the park. They never go flat. They weigh less than their airfilled counterparts, so add less weight to the balance bike. However, air filled tyres offer more traction and a smoother comfortable ride as they absorb the impact from bumps and lumps from the paths. They are also better for going up and down curbs and on uneven terrain and surfaces. But they need some maintenance and do add weight to the balance bike. You also need to remember to check them. Ideally you will want the bike to last as long as possible. It should be able to last until they are ready for the transition to a bike with pedals. Therefore look for a bike which will grow with your child. This means the seat and the handlebars should be adjustable and the seat can be adjusted higher than they currently need. An adjustable seat is also great if you have older siblings who may also want to have a go on the bike. You can adjust it to their height so they can have a go as well. If your child has younger siblings you may also want the bike to last so it can pass onto them as well. Look to the materials and to reviews of the bikes to determine the quality and whether it will last. Obviously if you would like to pass the bike onto a younger child or perhaps sell the bike after you have finished using it, it may be worth paying a little bit more for a bike that is guaranteed to last.